Massaman Curry with Chicken (Kaeng Masaman Gai) | Love.Food.Asia. Massaman isn’t a typical Thai word. The curry is originated in the 17th century in Central Thailand at the cosmopolitan court of Ayutthaya. It was brought to Thailand by persian traders. This famous Thai curry is rich and very flavorful. Due to its Muslim roots and therefore Islamic dietary laws, this curry is most commonly made with chicken, but there are also variations on this dish using duck, beef, mutton or goat. The creamy coconut milk makes this curry a savory and delicious dish you can´t resist. In the beginning pour 400 ml coconut milk in a bowl and bring to a simmer. Add curry paste and simmer. 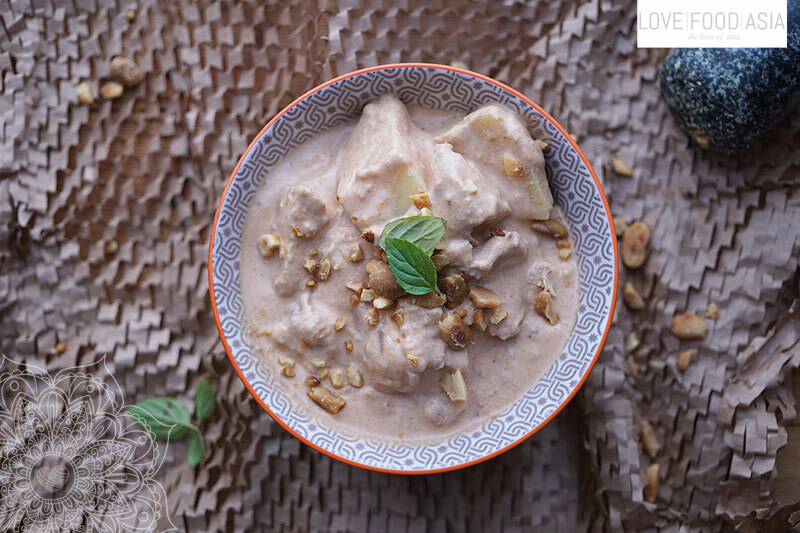 Add chicken, roasted peanuts and mix to a creamy sauce. Now add potato dice, fish sauce, palm sugar, cinnamon stick and star anis. Pour in another 400 ml coconut milk. Cover pot and simmer for 10 minutes on low heat. Stir in onions and simmer for another 5-10 minutes. In the end pour in tamarind water and simmer for one more minute. Taste with fish sauce and serve with fresh thai basil.